If you wish to cancel or move an appointment this can either be done by telephoning the surgery on 01297 20616 or by using our online services. To access the online services you do have to register. Please click here to download and print our SystmOnline Registration Form. If you are already signed up to SystmOnline, please click here to login to cancel or move your appointment. Additionally, you have the option to use eConsult. This offers you a range of options from helping yourself, finding the nearest pharmacy who can offer advice or consulting your GP via an online form. If you opt for a GP consultation by completing the latter, your GP will revert back to your within a set period of time. If you wish to use this service, please click the image below which will direct you to the relevant webpage. Your local pharmacist is an expert in medicines and they can also help you with minor health concerns. They are able to offer you clinical advice and provide over-the-counter medicines for a variety of minor ailments and illnesses including coughs and colds, tummy troubles, sore throats and general aches and pains. 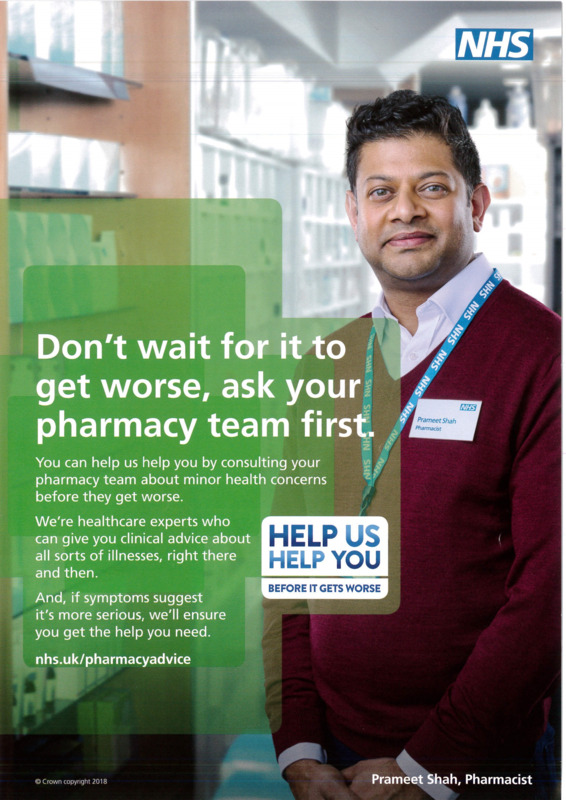 More details of how your Pharmacist may be able to help you can be found at www.nhs.uk/pharmacyadvice.